Living Solutions was set up as a social enterprise by two graduates of Fife’s School for Social Entrepreneurs (The SSE), to tackle social and environmental problems in Fife, in particular; unemployment, fuel poverty, species loss and climate change. 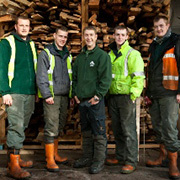 Woodlands The woodlands team works mainly in Forestry commission land carrying out environmental improvements such as selective felling to improve to woodland environment. The team is led by Les Keyte, a highly qualified woodsman who is licensed to fell all sizes of trees with a chainsaw and can deal with multiple windblown trees. Volunteers on this project receive specialist NPTC chainsaw training. We work mainly for a local housing association and also run an allotment project in partnership with Lochgelly High School which teaches young people about organic gardening, food and healthy living. Volunteer opportunities are available where you can learn various gardening techniques and skills, how to use common gardening equipment and even gain a qualification in chemical spraying.